The Blacklining range of products is owned, developed and distributed by Electronic Memory Services Ltd. Established in 1995 and based in London, EMS produces software products for professional publishers and content creators. Our specialist knowledge comes from many years of combined experience serving the financial and newspaper industry, providing innovative solutions based on Quark, Adobe and Microsoft software. EMS Ltd launched the first Blacklining over 15 years ago in 1996. Blacklining has since then been continuously developed and enhanced to the highest standards to meet regulatory and client requirements. Our client list includes many of the top 1000 companies world-wide. Blacklining is a tool for all users who need to provide an audit of text changes in QuarkXPress or InDesign documents. It is essential for users in financial, legal, reporting, medical and other markets where the tracking of text content changes is critical to their business. Sure you know what's changed? Regulations now make executives of companies personally responsible for the content in their publications and Blacklining ensures that they are able to be fully secure in the knowledge that they have reviewed all the alterations that may have occurred. Blacklining works in conjunction with QuarkXpress or InDesign to allow a user to retain a complete audit trail of all changes made to text. Those who work with financial, legal, and other exact documentation will find this an essential tool. If a run of text or word or letter is deleted it will be marked as "Struck-Through" that is a line through the centre of it in a bold form or colour that shows it as being struck out. New text that is inserted will be marked as underlined again in bold or coloured so that it is apparent to the reader that it is a new insert. It may be obvious though that to retain all the deleted text in a document could mean that it becomes greatly increased in pagination to encompass all the deletes; to enable the pagination to remain correct, it is possible to change views so that struck-through text is hidden but its presence marked only by a small mark or caret to show that a deletion has occurred. Words that have been inserted or deleted will appear or disappear depending on the revision level being displayed; up to 98 revisions level can be recorded. 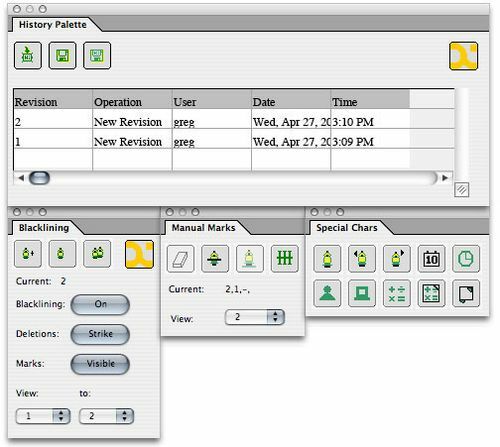 A special characters' feature allows a live header of a document to be created so that, if used on a master page for example, all pages can have document information such as name, date and time, as well as Blacklining revision numbers and a checksum. A history file records the actions taken in a documents' history and this can be printed or exported - which may be useful for billing or auditing. Mac and Windows versions available (Mac Universal PowerPC and Intel for XPress 7). Many new regulations now make executives of companies personally responsible for the content in their publications and Blacklining ensures that they, and the companies that serve them to provide their documentation, are able to be fully compliant and secure in the knowledge that they have reviewed all the alterations that may have occurred. Investing in Blacklining will ensure that users are able to meet these new audit standards and provide an excellent return on investment. Blacklining is used in corporate, financial and legal document production as well as in editorial environments where changes to text must be recorded and displayed. Legislative, legal and security requirements are always increasing and the use of Blacklining enables users, readers and executives to be able to demonstrate a complete control document control and history. The original version of Blacklining has been available since 1996 and is widely adopted by major companies involved in preparing such documents as Annual Report & Accounts, Share Issues, Bond and Debt Issues, and statutory reporting to US (EDGAR), UK and other stock exchanges. Indeed, for certain types of document, maintaining an audit trail of changes is a mandatory requirement of such regulatory bodies as SEC (Securities and Exchange Commission) in the US, LSE (London Stock Exchange) and FSA (Financial Services Authority) in the UK. Blacklining has over time gained new features which increased its value in a wide range of non-financial sectors such as legal documents, disclaimers, terms and conditions, and government reporting. Many non-financial industries are also now stringently regulated so Blacklining QuarkXPress might well be used for documents relating to pharmaceuticals, health and safety, food labelling, and so on. Blacklining provides particular benefits for the production of consultative documents. A good example might be a committee, which is preparing an industry standard or specification. Typically, the members of such committees are in several different countries. Amendments can be clearly indicated and the revised draft circulated as a PDF for the next round of consultation.